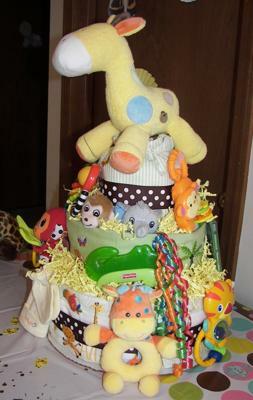 Awesome diaper cake. Awesome theme. Awesome ideas! 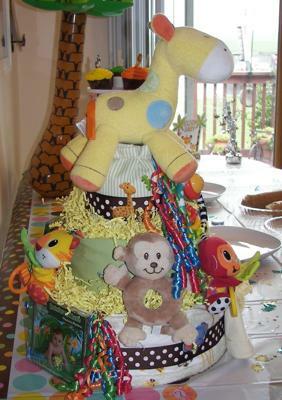 Kelley submitted her cute diaper cake photos and ideas for the rest of us to enjoy! We love our readers! 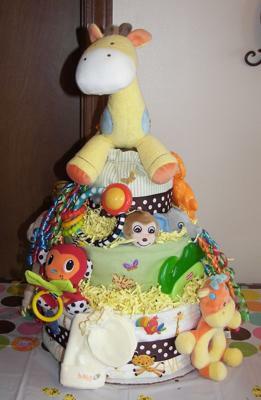 If you have a diaper cake to share, send it on over to us right here! After searching for hours on the internet, I finally came up with a diaper cake that I thought I could put together. The one gal said it right, they are not hard to do. I used a bathtub mat for the middle of mine. It seemed to be the right size. I had some animals from previous occasions so I used those on the cake also. Just about the same ones as the one on the net. I used the FP stickers from Hobby Lobby and some yellow paper for the frosting. Pretty fun all in all! This baby shower is going to be a blast!